The fourth training of the project "Strengthening Respect for Human Rights of Women in Turkey", conducted by Istanbul Bilgi University Human Rights Law Research Center and supported by Raoul Wallenberg Institute of Human Rights and Humanitarian Law and Swedish International Development Cooperation Agency, was held between 3-7 March 2007 in Istanbul. 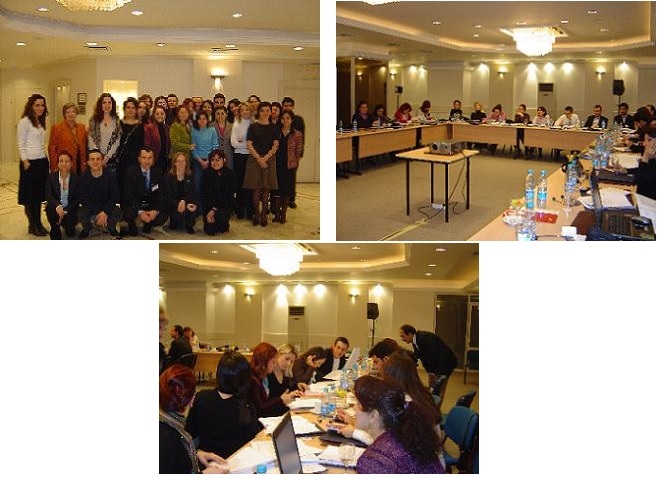 The training seminar lasted for five days and 26 lawyers from Adıyaman, Balıkesir, Bolu, Bursa, Çanakkale, Düzce, Edirne, İstanbul, Kırklareli, Kocaeli, Malatya, Mersin, Nevşehir, Sakarya, Siirt, Sivas, Van and Yalova Bars attended. The local experts were selected by Bilgi University and the international expert was selected by RWI. The local experts were Prof. Feride Acar (Chairwoman, Middle East Technical University, Department of Political Science and Public Administration, Ex-Chairwoman of the Committee on the Elimination of Discrimination Against Women), Assoc. Prof. Bertil Emrah Oder (Istanbul University, Faculty of Law), Assoc. Prof. Kadriye Bakirci, Istanbul Technical University, Faculty of Management, Assistant Professor Dolunay Ozbek (Istanbul Bilgi University, Faculty of Law), Ms Asuman Aytekin Inceoglu, LLM, Istanbul Bilgi University Faculty of Law and Ms Filiz Kerestecioglu, Member of Istanbul Bar Association. The international expert was Dr Ilaria Bottigliero, researcher, RWI.